Every large event requires coordination and organization. With the right items, you’ll be able to stay relaxed and can ensure everyone has a great time throughout the event. If you’re planning a large event, you may already be familiar with the stress of not forgetting a crucial detail. Despite a million checklists, your event is personal and thinking through everything you need should be too. That’s why we’re sharing techniques to help you imagine your event and identify which items you need to rent to make your event a smashing success. What’s happening during your event? Whether it’s a gala, wedding, or festival, the easiest way to make sure you don’t forget anything is to imagine your event hour by hour from various guests point of view. Start with them driving to the event, followed by the meals, activities, and wrapping up; picturing what a variety of guests may require or desire can help you ensure details aren’t missed. For instance, guests with limited mobility will need plenty of time and places to rest, while those who are looking to dance or participate in activities may want different options like corn hole or dance floors. For meals, thinking about the food you are hoping to offer and ensuring that they will have the dishes and table decor details you’re looking for. What do they provide? Some venues require you to bring your own tables, chairs, and lighting. Others may provide all but dishes and linens. Learning the intricacies of the event venue will help you compose a list of items you may need to rent for the big day. Indoors? Outdoors? Either way, weather may impact the mood or items you need. Especially for events that are partially outdoors having tents and climate control options will ensure your event is comfortable for attendees. Without these items, weather can ruin even the best laid plans. Make sure you talk with your venue and rental company about the size of your event as well as your hour-by-hour plan so that they can help facilitate a smooth event. Different tents serve different purposes. From clearspan modern tents and frame canopies and specialty tents for elegant events and weddings, to marquee tents and pole tents to help create spaces for celebration and gathering, you’ll want to speak with an expert to determine how many you’ll need for your event. Check out your options here. Food and drink are often the center of a great event. With the help of an experienced vendor like Marquee Event Rentals, you’ll be able to get everything you need in the style you love. With bar service items, china, and flatware, you can customize the experience of your guests for a lower price than buying and a classy elegant look you can’t achieve with disposables. Chairs and seating help accommodate your guests throughout your wedding or event. There are many options that may suit your needs, depending on the formality, setting, and venue. 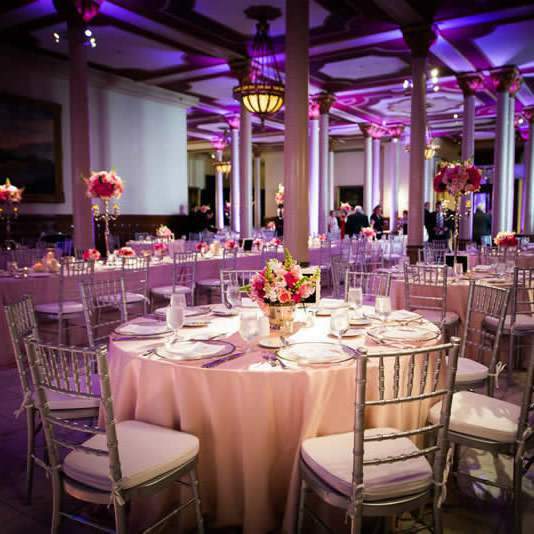 From folding chairs to chiavari chairs, barstools, and chameleon chairs, you’ll be able to customize the look and feel of your event to match your personality and the mood. No one likes being uncomfortable at an event. Whether it’s sweltering or people are shivering, ensuring a comfortable consistent temperature helps guests enjoy their time and not be distracted by the weather. With air conditioners, heaters, and fans, you’ll be able to help make even the most trying weather feel more bearable. With the right climate control, you can transition daytime events to night without your guests getting chilly as well. From tables to lounge furniture, you will need to accommodate your guests needs in various situations. Whether you need lounge furniture like sofas and ottomans or tables, understanding the purpose and use for each will make your party or event run smoothly. For instance, there are many varieties of tables you can choose from, including round and square, to specialty bistro or banquet style. Make sure you’re specific about your needs, whether you want wood or a certain color. You don’t want to end up hating the tables you get, even if you’re covering them up. From texture to color, linens tell a story at your event. Use them to help personalize the overall look and feel of the event, whether you’re going for a luxurious velvet look or a satin glow. Choose your fabrics with care and you’ll achieve a look you’ll love. Chandeliers, spotlights, string lights, oh my! The possibilities for lighting your event are endless. Depending on the vibe you’re looking for, you’ll be able to select lighting that helps you continue to tell the story of your event. We suggest thinking about the time of day, location, and venue when selecting your lighting, as well as coordinating lighting with the rest of your rental items such as furniture, linens, and china. Dance floors and stages!? For every great event, dancing or presenting can be a must. If you need these services, you’ll be able to use various flooring types (carpet, wood, etc.) to help achieve the look you want for your event. Have a blast! Ready to get your rentals in order? Reach out to us today to get started!